When we hear about the Lord, we should hear with a spirit to serve the Lord. 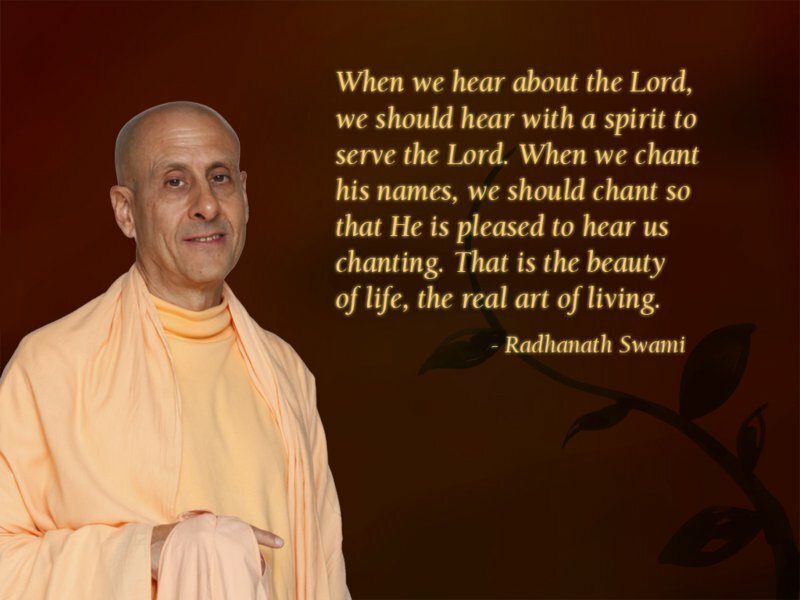 When we chant his names, we should chant so that He is pleased to hear us chanting. That is the beauty of life, the real art of living. Natural life is when the power of love forces you to always do the right thing. The person who has not at any time received the dust of the feet of the Lord's pure devotee upon his head is certainly a dead body and the person who has never experienced the aroma of the tulasi leaves from the lotus feet of the Lord is also a dead body, although breathing. The exalted people in human society live very simply; they do not increase their artificial needs. Rather, as much as possible they decrease eating, sleeping, mating and defending. Whatever way they can simply fulfill that, they do that, so as to concentrate more time and energy for fulfilling the real purpose of human life: to understand Krishna. Actually you can live very simply. You don’t need so many things. Modern society, they have given the idea that you need so many things: unless you have twenty pairs of shoes you can’t survive. It’s not true. You don’t need so many things. You don’t need so many different clothes and you certainly don’t need TV.